My copy of Veganomicon finally arrived in the mail a few days ago. For some reason it was released later in Canada than in the States, and what with Canada Post . . . . Anyway, the good news is it is finally here! Things have been so busy here, though, that I have not had any time to sit down and look through the recipes in any great detail. I like to read a new cookbook from cover to cover first, so I can get a good sense of what it is all about, and so I can piece together meal plans in my head. Maybe this weekend . . . . So, on to the cutlets! I read about them on a few blogs, so I looked them up. 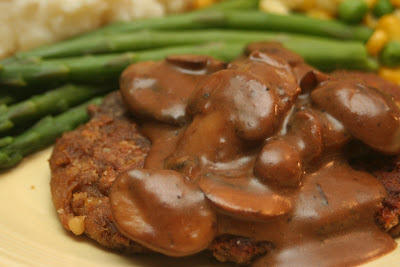 They seemed perfect--a seitan-like texture without the hours and hours of simmering. What's not to like? Here is my take: First, the texture is not bad but is a bit on the chewy/stringy side. I could feel the cutlet sitting there in my stomach afterward like a lump. But, I have been known to bolt down dinner with minimal chewing. Second, the recipe calls to pan fry the cutlet for 6-7 mins per side. This is a little tricky. It's hard to find the right temperature: too hot and you burn the outside before the inside is cooked, too cool and you get raw cutlet. Blech. I think next time I will bake it, as is also suggested. I just did not have the time tonight. Lastly, a note on prep. The recipe calls to mash a can of chickpeas with a fork until no whole chickpeas remain. This takes forever, especially since I doubled the recipe. I think next time I will pulse them in a food processor for a smoother texture. So, the final verdict? I am going to give the dish a 7.5/10. The boys loved them (Son #1 ate two cutlets with great relish), so that is a big plus. I also think the recipe has great potential--I will experiment next time with some different spices since the cutlet as is is kind of neutral. I also made a mushroom gravy to pour over top, which made it less plain. 1. Saute an 80z pkg of sliced cremini mushroom in 4 tbsp of oil for 10 mins, until golden brown. 2. Sprinkle 2 tbsp of flour over top and stir until well mixed. 3. Slowly pour in 1 cup of plain soy milk, stirring constantly. Bring to bubbling and let thicken. 4. Stir in 1 tbsp mushroom soy sauce, 1 tsp of sage, and salt and pepper to taste. You can make this thinner or thicker, depending on what you like. If you need more gravy, add in more soy milk and some dissolved cornstarch to thicken. A Note to Isa: No Dissing Intended! Tim Horton Was a Vegan?